TORONTO — Radek Faksa couldn’t catch a break. 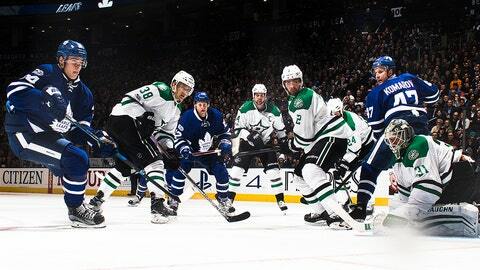 At the beginning of the third period, Maple Leafs defenseman Jake Gardiner muscled his way past the Dallas Stars center to easily exit the Toronto zone. Seconds later, Faksa had trouble accepting a centering pass in front of Leafs backup goaltender Curtis McElhinney. Gardiner had already torched the Leafs for the opening goal of the game and McElhinney himself managed to stand tall in the face of 40 Stars shots for a 3–1 Toronto win, his second with the team. Faksa’s shift summed up the frustrating nature of the Stars’ season to this point: one of continued penalty trouble and missed opportunities. And with the Western Conference playoff picture slowly beginning to fade, the 2016–17 season is beginning to look like one entire missed opportunity for the Stars. Now six points out of a playoff spot after their third loss in a row, this Stars team looked a far cry from the team that came out flying and put up five goals against the Leafs in the first period last week. This was not where many had pegged the Stars team to be approaching mid-February. And the dour mood in the visitor’s dressing room of the Air Canada Centre told a similar story: third from the bottom in the Western Conference isn’t where the team expected itself to be. “We’re all sick of talking about it,” Stars forward Tyler Seguin said of the team’s mounting losses. Dallas has now lost three in a row and eight of its last 11. “We’ve got to all be professional in here, hold each other accountable and get out of this together,” he said. But “this” may be too insurmountable an obstacle to overcome. An ugly road record (7-14-4) and the NHL’s worst shorthanded save percentage tell a significant part of the story. “It’s kind of been the story of the season. The way we’ve been finding ways to lose is by taking penalties,” said Stars defenseman Dan Hamhuis. Midway through the third period, Faksa was dealt the rarely used “using his hand on the faceoff” penalty. That would send the Leafs to a 5-on-3 power play where, with a wrist shot from the slot, Leafs defenseman Nikita Zaitsev put the nail in the coffin with the decisive third goal. “We just shot ourselves in the foot with penalties in the third,” said Benn. When you have the league’s worst penalty kill (73.3%) up against the league’s second-best power play, taking bad penalties is a recipe for disaster. Sure, teams tighten up in the playoffs and take less penalties, but the Stars play as of late makes it seem unlikely that they’ll get there. As the trade deadline approaches, the status of the Stars as buyers or sellers could very well shift toward the latter. It’s been a surprising, and surprisingly disappointing season in Dallas after the team’s second-round playoff exit last season. What was once a team that hoped to build on that success is now a team that hopes to just get back to the postseason. Jamie Benn was asked about the playoff picture math and didn’t hold back. Immediately before answering, he tossed an empty water bottle toward a garbage can in the center of the visitor’s dressing room. The bottle rattled off the can and fell, to the floor.